This bracelet is a wonderful light-weight, patriotic bracelet. All the crystals are hand cut Chinese crystals with tapered corners. The Red, White, and Blue is a reminder of our freedom, and to thank God for what we have been blessed with, and to pray we do not lose our freedom. This piece is currently available. Today’s bracelet is a copper masterpiece. All the wire work is made up of different gage copper wire. Inside the 20gage ovals are brick blue iolite. This piece is comfortable to wear, and can go with just about any outfit. This piece is currently for sale! Today’s Bracelet is a great new bracelet exhibiting a new technique. This bracelet is made of alternating metals: brass and copper, with a brass toggle. All the pieces here were hand-stamped out of a large metal sheet, and the inspirational words of “LOVE” and “LAUGH” on the toggle were hand stamped. All the wire work here was hand twisted. Today’s piece is a spring bracelet. Each of the wire sets of coils and connectors is Sterling silver (.925 Silver). The Chinese crystals in this bracelet are a light purple. This bracelet is currently for sale. Today’s piece is a hand-made masterpiece. All of the wire-work is hand-twisted, and the pieces link together like a bicycle chain, which allows the bracelet to be worn securely and comfortably. In the bracelet, there are two taper facet gray Swarovski crystals and a tube faceted Chinese crystal in the centered in the bracelet. This piece is currently available! Today’s piece is a set of beverage charms. These charms are hand-twisted from brass wire. The theme of this set is bowling. There is a bowling ball, bowling pin, strike symbol and the spare symbol. This set is currently available! If you would like this set, a similar piece, or any unique piece of jewelry; contact us! Today’s piece are a hand-knitted pair of earrings. 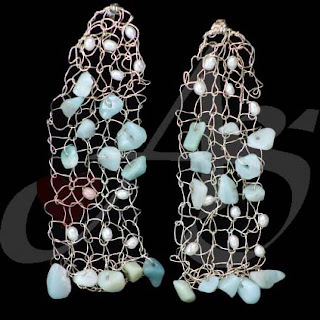 Strung into the knitting are small amazonite chips and rice sheen white freshwater pearls. The inspiration from this piece was a winter waterfall of ice and snow… however it can also represent rain – which we have been getting a lot of! This piece has an accompanying pin. Both the pin and earrings are available for sale! Today’s piece is a rosary bracelet. 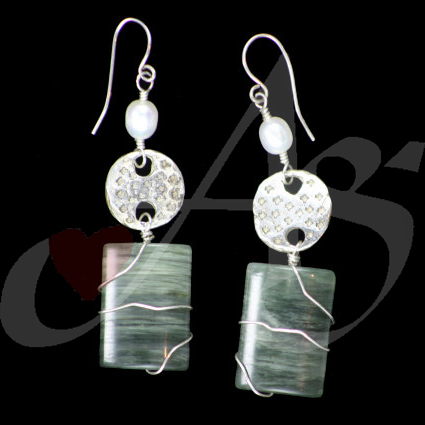 Made with thick-guage wire, the beads dangle freely and give a great sound! This is an inconspicuous Rosary Bracelet because there is not much difference from the Our Father beads and the Hail Mary beads other than the size of the bead. The triangular stones are metallic black sandstone. As with all our pieces, all the wire work is hand-made. This piece is currently available. Today’s piece is a special order earring. These earrings are specially made with the image of the Holy Spirit dove on the front. 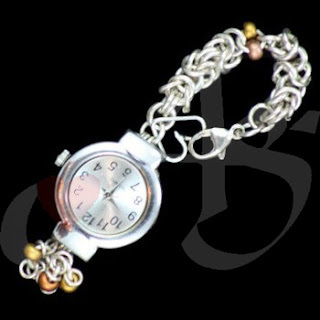 Today’s item is a watch. We haven’t put a watch up yet, and this one is unique. If you do not like wearing a watch on your wrist, or if your job does not permit it, you can hook this watch anywhere! Hang the watch from anywhere that the hook will fit! The hook is hand-made chainmail with bronze seed beads. This piece is currently available! Today's Bracelet is another piece that you may see in the Art for God's Sake this weekend. This bracelet is built of handmade polymer squares. On one side are hand coiled bits of wire, to represent the universe and immense space. On the other side are the words, "Life is a whirlwind I am but a speck of dust a mere nothing yet immensely important to God". 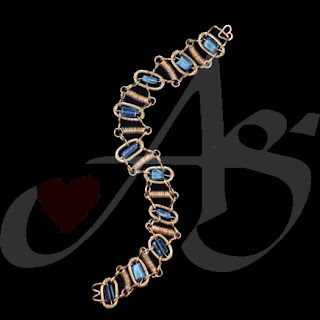 This bracelet utilizes sterling silver, copper and some brass. If you would like a similar piece or any unique piece of jewelry; contact us! Today’s piece is a ring. 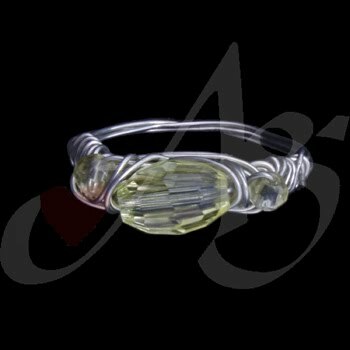 This ring is made with half-round sterling silver wire. 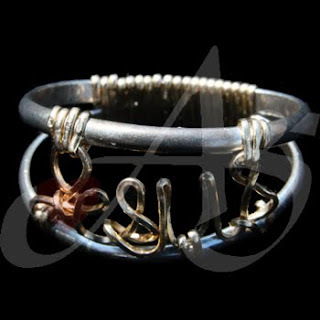 “JESUS” is hand twisted cursive writing out of 14k Gold-filled wire. This piece will be featured in the Art For God’s Sake, along with many other pieces. This piece is currently available. Today’s rosary is a special Rosary for a few reasons. 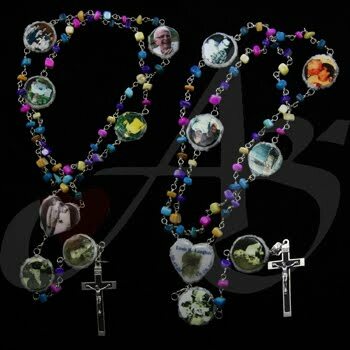 Firstly, this is a resurrection Rosary, so all of the images represent a memory of the deceased person. The colors of the stones represent the individual’s colorful personality and involvement with De Colores. Most importantly, the thumbprint of the resurrected soul is on the centerpiece, so that they may pray the Rosary with you. Secondly, this rosary was given on Mother’s Day which is an added bonus. This Rosary is definitely one of a kind! This is a great Mother’s Day gift! We apologize for not getting this out yesterday, but we were in a situation without internet… who knew? We are glad to be back! 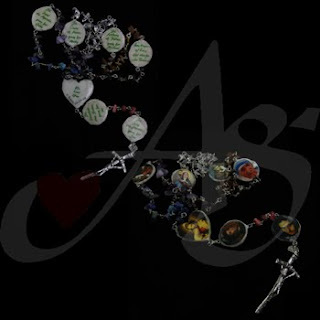 Back to the rosary… This here is a family rosary for the mother. Rather than having the children’s names on the Our-Father pieces, the patron saint of each of the children are on the Our Father, and “St. ____ please pray for ____.” written on the opposite side. 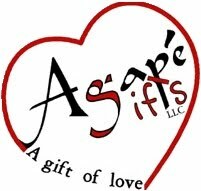 The mother has a devotion to Blessed Theresa of Calcutta, and as an added bonus, Agape Gifts devoted one of the Our Father pieces to Mother Theresa, with a copy of words in her own handwriting on the flip-side. The center piece has the Virgin Mary on one side and “We Love You” on the other. The two Our Father beads next to the Crucifix are the mother and father’s confirmation saints. 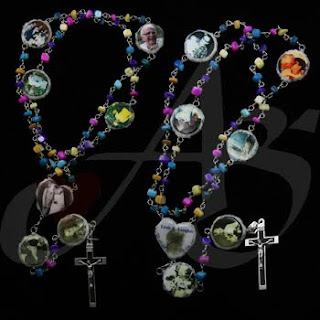 A John Paul II Crucifix is on this Rosary… who doesn’t want the intercession of BLESSED Pope John Paul II? 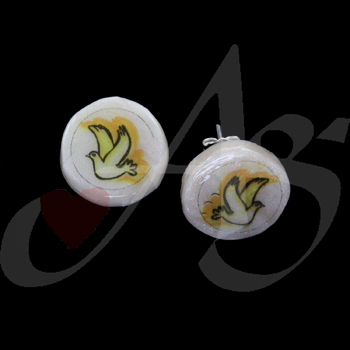 Here is a pair of First Communion earrings. These earrings are great when you don’t want big dangles. 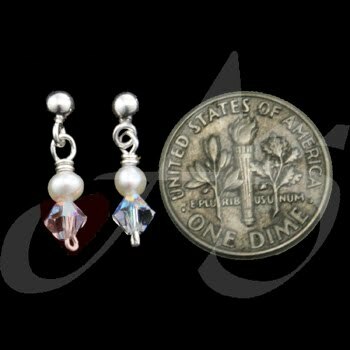 The ratio of earrings to the neighboring dime is 1:1, but the image is enlarged to show detail. Now you, or your daughter, can have that extra glam without big earrings! This piece is currently available. Today’s piece is a flashy bracelet. 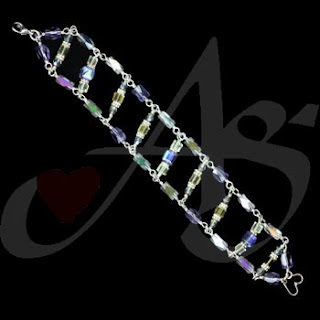 The stones in this bracelet are multi-shaped, multi-colored, Aurora Borealis colored crystals. This bracelet is made with the same unbreakable technologies as our Rosaries, and so it is very durable. This piece is currently available. These earrings have a ‘Native Indian flair’. They are made with turquoise stones on the top with a sterling silvers spacer beneath them, and then hand-pounded wire tapering on the bottom. We haven’t highlighted many rings, so that is what has been selected for today. This is a rather simple ring; it has three yellow Chinese crystals wrapped into a nickel band. Because this is made with nickel, it will not tarnish and is hypo-allergenic. This ring is currently available. Today’s selected piece is an ankle bracelet. This anklet is hand-twisted and is made with the same unbreakable technology as our rosaries. The green balls are yellow jasper, and the smaller green buttons are green peridot. This piece is currently available. If you would like this piece, a similar piece or any unique piece of jewelry; contact us!